Sometimes a cheese quesadilla is just not enough. Life needs color, and so does a quick cheesy meal. For this light dinner treat, I took it upon myself to add some punch and vitamins. 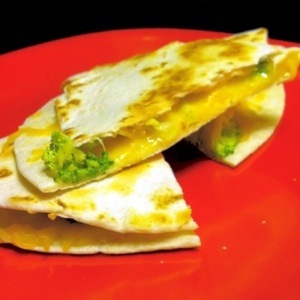 Take a sprinkle of shredded cheddar cheese, some cayenne, a dash of cumin, and a sprinkling of broccoli (diced) and place it into a flour tortilla. I usually have my frying pan on medium-low and place a tortilla in the pan. I place the ingredients in half of the tortilla and then fold over the other half. Flip it when the under side is crispy and the cheese is starting to melt. That’s usually about four minutes or so on each side. A quesadilla that’s nice and simple yet packs a punch. Love it. Thanks for sharing it.